The best gas fire pit is safe, easy to use, smoke free and requires little to no setup, making it ideal for any backyard or patio. Plus, gas fire pits have the added advantages of simple heat controls and they don’t require bundles of wood, kindling and lighter fluid every time you want to get a cheery blaze going after a long day of work. Let’s go ahead and take a look at a few of the best gas fire pits for different occasions. If you’re looking for a contemporary fire pit with a bit of rustic flair, the Bond and Lori Fire Table should be top on your list. 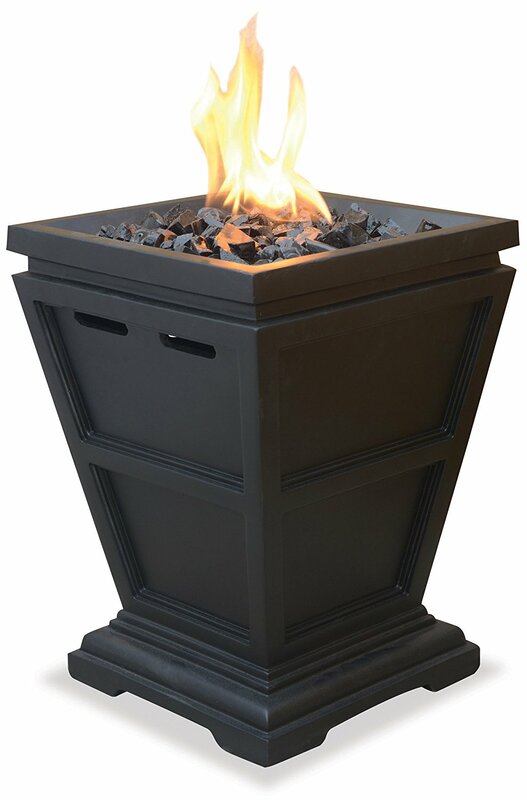 With a great flame profile, high build quality and easy assembly this is a perfect fire pit for any backyard. Easy to use automatic ignition button to quickly get your fire up and running. Included regulator and connector for propane tank . Ships with dark red-brown lava rocks for even heat distribution. Extremely high build quality that will withstand the elements. Came with a clear instruction manual and was easily assembled in less than 45 minutes. Great style with a dark coppery brown exterior surrounded by black accents, a gorgeous stone tile top and natural curving design elements. Ample space for hot drinks and h’orderves with a 30”x30” surface and a 24” table height. Supreme heat output that can warm nearby areas even on a chilly night. The only real grip we had with this unit was how easy it was to scratch the table top. It seems that the tiles, while strong, are easily marred by rough materials. Be sure to pay close attention when pouring in the lava rocks as a single dropped stone can easily result in a few surface scratches on the tile. This superb gas fire pit doesn’t compromise on heat output, materials or design. With an eye catching slate mantle, a wicker woven steel base and a weather resistant build, you’ll be sure to enjoy this outdoor fire pit for many years to come. Weather resistant steel construction with a durable exterior coating. 30,000 BTUs of heat output and easy flame adjustment with the hidden controls. Conveniently located automatic ignition for simple startup and shutdown. Includes a sizable bag of rust colored lava rocks to fill up the fire bowl. We loved the hidden control panel that was out of the way, yet conveniently located when we needed it. The slate tile mantel looks incredible in the firelight, is very resistant to chipping under heavy use and due to the high quality stone is near impervious to the elements. Very sturdy steel design with enough weight that we didn’t worry about it blowing over in the wind. 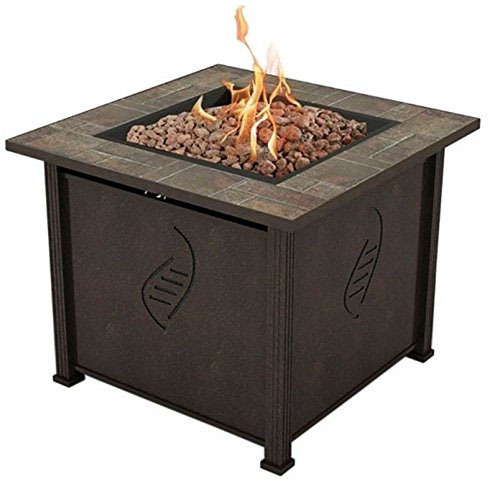 This gas fire pit is a great value, especially considering how high quality the materials are compared the the price tag. While not very visually distracting, we did notice the propane tank was visible during the day through the wicker woven steel of the base unit, as night fell this was not an issue. We also found that the automatic ignition sometimes took a few clicks for the flame to catch if there was a strong breeze. When it comes to large gatherings, you’ll need a gas fire pit to match. This choice offers great space, a lightweight design and adds a decorative touch to any outdoor space. We especially love the fire bowl cover which allows the unit to convert into a full size outdoor table if it’s a bit to early in the day to light up the flames. Textured dark brown and bronze finish that give this gas fire pit an incredible ambiance and overall look. Large 45”x45” coated aluminium table top that is perfect for bigger gatherings or fireside meals. Ships with a sturdy fire bowl cover to convert the gas fire pit into a fully functional outdoor table. Clear fire glass beads are supplied with the unit and do not need to be purchased separately. Holds a standard 20 lb. propane tank hidden under the table top for hours of dancing flames. We loved that the large 45”x45” fire pit tabletop could fit all our friends, family and food with room to spare. The larger size was especially useful when we had parties and people wanted to crowd in around the flames. This gas fire pit puts out a phenomenal amount of heat, which is great for breezy summer nights or chilly winter mornings. The flame profile was incredibly vibrant and extremely adjustable, we managed to have 15” flames for most of the night making for a beautiful display against the dark sky. Unlike most large units, the BCP Extruded Aluminum fire pit table is very light for its size and can easily be moved around the yard to make way for extra guests or furniture. Assembly was very quick with the included instructions and the whole process took next to no time. As with a few of the other gas fire pits that include automatic ignition, the BCP gas fire pit can potentially have issues getting the flame started. Our unit had no trouble starting up but it is a common issue among electric ignition switches, especially if you live in a humid environment. A standalone lighter solves the issue while only imposing a minor inconvenience. 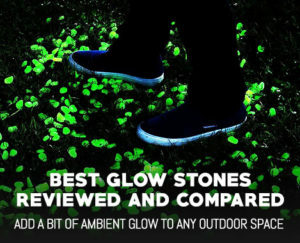 If you’re looking for more of a classic campfire experience that is complete with natural looking stone, flickering flames and a low profile design, this is a great choice. 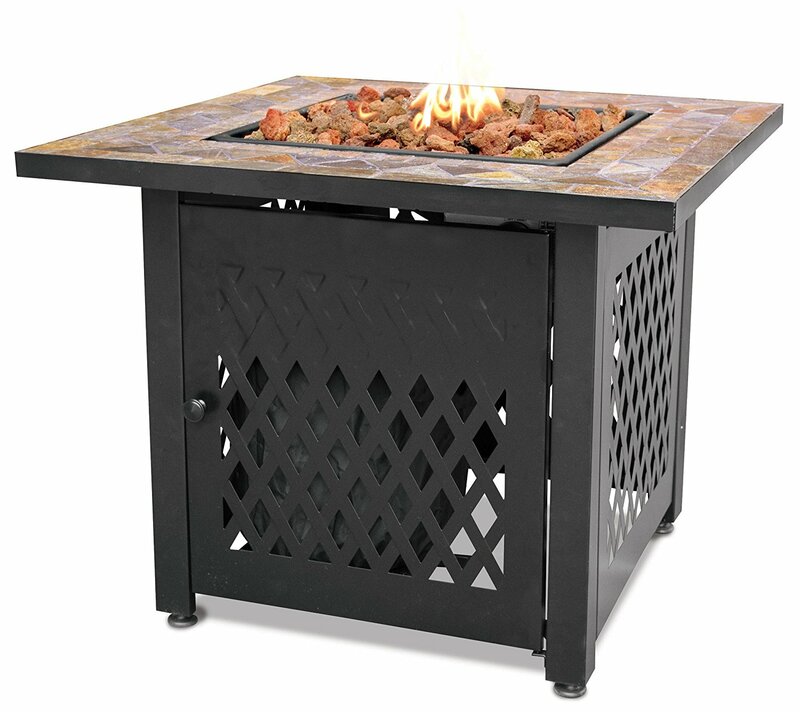 Not to mention, this gas fire pit fits great in areas with limited space or where there is quite a bit of pre-existing outdoor furniture in place. The unit includes a one-step spark-ignition button for quick flames even on windy days. A large flame adjustment knob is located on the side of the unit within easy reach. Produces a whopping 30,000 BTUs of heat from the single burner. 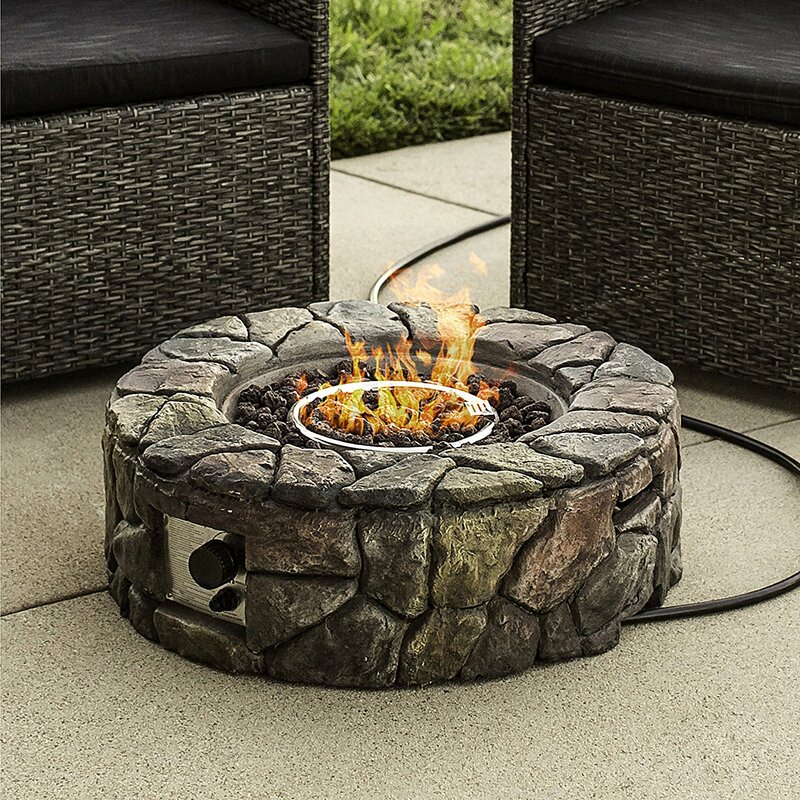 At only 9.1” in height this stone fire pit is great for small spaces and cramped patios. Weighing in at 40 lbs., this is a very lightweight unit that can easily be moved into a garage, RV or car for your next camping trip or family gathering. For a gas fire pit of this size we enjoyed how the heat warmed our legs as well as our torsos, many larger units have flames that start much higher up. This was about as close as we could come to having a real campfire on our patio and gave us that warm, fuzzy feeling once it was up and running. The stone finish is very durable and was great for warming cold feet so long as the flames are set at a lower level. 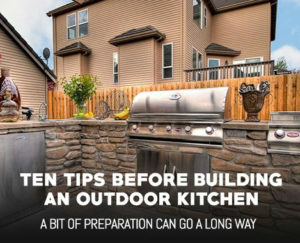 One of the major drawbacks, or at least difference, with this unit is the propane tank is not hidden by the fire pit, but is instead placed around 10’ away with the included hose. This makes the main fire pity have a small form factor but detracts slightly from its visual appeal if you can’t hide the tank. We also wished the Flame adjustment panel had been a darker color so it would blend in with the overall stone finish instead of standing out. As one of the smallest, highest power and most portable gas fire pits on the market this option is typically our number one choice for new and current fire pit owners. It is incredibly reliable, durable and the thing just works. Period. Unless you need a decorative element to your gas fire pit or a table for entertaining guess, this is probably the one to get. Reliable chrome and rubber auto-ignition switch for effortless flames and easy heat adjustment. Includes hybrid lid / carry case and a 10’ gas hose for convenient positioning. Ships with a multitude of lava rocks for a beautiful flame profile and heat dissipation. Extremely portable design at 24.5 pounds and is just as perfect for the patio as it is for the forest. 58,000 BTUs of heat output, which is enough for all but the coldest of winter nights. 19” fire pit diameter is perfect for medium sized gatherings and yet still retains its portability. Included carrying strap makes it a super easy to sling the Outland Firebowl over your back and move it to your preferred location. This gas fire pit is the perfect blend of portability and power and is honestly the best gas fire pit around for the money. The flames can be adjusted to extremely large or very low and the auto ignition works every time. Being made entirely of metal, this fire pit is incredible durable and can withstand drops, kicks and any sort of abuse you can imagine. Honestly this thing just works, almost nobody who has purchased this unit has had any complaints and unless you need a fire pit with a built in table, this is the way to go. This only downside to this unit, if you can even call it that, is that it is not a “designer” fire pit. And by that we mean it doesn’t have any fancy inlays or natural designs to fit in with existing furniture. However the sheer reliability, heat output and portability of this unit more than make up for any loss in the style department. If you’re looking for a more in depth review of the Outland Firebowl Premium, check out our detailed individual review of the unit. When it comes to gas fire pits, bigger isn’t always better. The Endless Summer option offers a great budget gas fire pit that looks incredible, doesn’t take up too much space and performs incredibly well. Compact 10,000 BTU burner that is perfect for patio accents, small families or simply to show off. Completely hidden control panel with automatic ignition and flame control adjustments for a seamless design silhouette. Stylish slate finish that can take a beating and still look great. Includes black fire glass that is a wonderful complement to the color of the main unit. This unit looks great, it is more refined than most of the larger options and its small silhouette is perfect for nearly any space. At 15” tall it was the perfect height for warming your hands but not too tall as to distract from the surroundings. If you buy a pair of these they work perfectly to frame a door or archway for an awesome fiery effect. One of the only major cons with this unit is the short burn time. The Endless Summer GLT1343SP takes a smaller than standard propane tank, meaning it burns for only a few hours at the highest setting. One a more realistic low setting it’ll last all night. We also found that changing the propane tank can be a bit of a challenge and balancing it on table and removing the tank from the bottom was the best way to go. Summary – What’s the Best Gas Fire Pit for you? Overall there are a lot of great gas fire pits on the market, many of which have very similar features and price points. 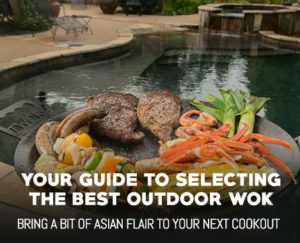 If you’re looking for a gas fire pit that includes a table for eating and entertaining guests we’d recommend the Best Choice Products BCP Extruded Aluminum – Gas Outdoor Fire Pit Table With Cover, otherwise your best bet for an extremely reliable and functional choice is the Outland Firebowl Premium Portable Propane Fire Pit. 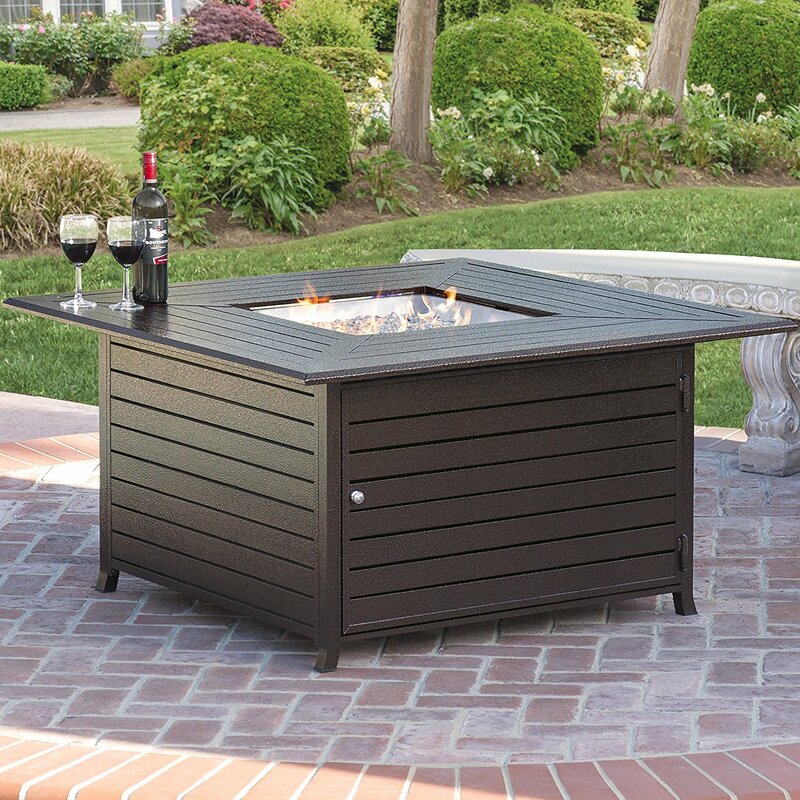 While we didn’t include it on this list, if you’re in the market for a more upscale fire table the Outland Fire Table is a top notch choice with an amazing design and stellar features. Whatever your final decision is you can rest assured that any of the above choices will bring a new level of comfort to any outdoor space and take your outdoor man cave to the next level. If after reading this article you’re still not sold on a gas fire pit, check out our best fire pit article which covers a greater range of options from wood burning fire pits to fire pit tables so you can make a more informed decision and get the right fire pit for you.